Next week marks the return of Ask Andy! I know...I don’t know how I’m going to wait either. The anticipation is killing me. If that’s not enough to get you hyped up, we’ll be giving away not one, but two GoPro HD Heroes. To help distract you and pass the time until the new video launches, here’s this week’s edition of The Weekly Wrap. Our most recent series on the Benchmark Blog was another hit. 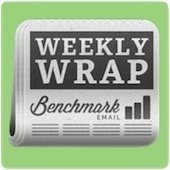 The guest bloggers that contribute to Benchmark Email never cease to amaze me. Check out Benchmark Email’s Complete Presence for Non-Profits Series. Take over the world! Or something slightly less hostile. Learn How to Become a Global Leader that Can Drive Global Competition. Nobody wants Mr. T to pity them. See how Random Acts of Marketing Are a Fool’s Errand. Tweet with your pinky out....or something like that. Find out what you need to do To Aspire to Social Media Elite: Les Musts de Twitter. Sure...sometimes Twitter is a place for me to brag about doing cooler things than my friends. It can also do good (besides boosting my self-esteem). Learn How to Design Your Social Profiles to Help Rather than Hinder. I don’t think Hal was referring to Simon Cowell, LA Reid, Demi Lovato and Britney Spears. Perhaps you and I should both read about the X-Factors that Lie Outside an Online Marketer’s Control.